It certainly is delicious looking. I mean technically the chocolate covered peanuts are a little weird with all their bumpiness, but does anyone really care out there? I don't, I'm diving in. There are definitely bites where this one tastes like a candy bar, and that's pretty cool. The only real negative is that their is an odd lingering aftertaste that is keeping this one from being great. 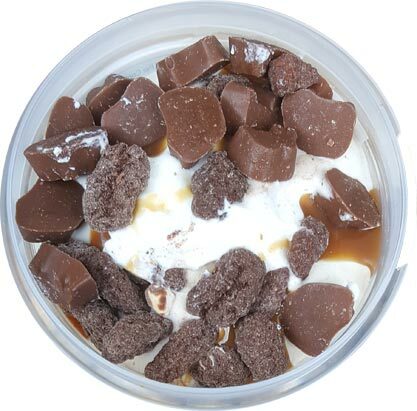 The oddness just makes you hesitate a bit more, and then you start thinking about how you'd like the base ice cream to be more hefty and solid, or you might wonder why it's not a peanut butter or a caramel base instead of a vanilla base. These are questions that pop in to my head when their is an oddness like this. It's harder to focus and analyze various aspects when you are bent on thinking "where is that strangeness coming from?" Jumping back to the 600 calorie thing, I really do feel guilty eating this entire thing in one sitting despite how unfilling it is. What I did on this round is to eat about 60% of it and then I will finish it off in about 90 minutes or so. [after about 3 hours that included a pretzel break] I'm not getting the exact same weirdness as before, but there is something amiss about this. Overall I still like the idea and I like when it clicks, but for me personally, one of the ingredients is bugging me a little. I still enjoyed it for the most part though. Thoughts? 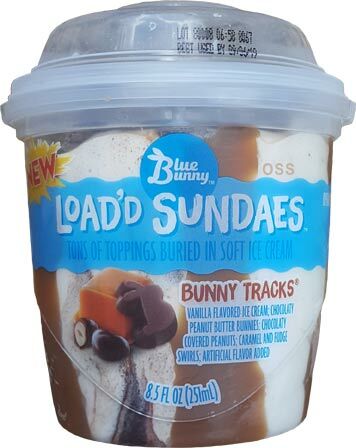 I thought 600 calories was the max for the Load'd Sundaes, but you have one more that tops that at 610 calories, the Peanut Butter Bunny. The others are mostly in the 500-550 range with a couple as low as 420 calories, but the picture you took sure makes it look good. Great comment though on the aftertaste. I thought Blue Bunny was a little more high quality (but perhaps I am thinking of Texas' Blue Bell.) Always lovin' what you do. What bothers me is that it's not a peanut butter swirl. What the hell? I'm not eating a 600 cal cup of ice cream dessert with an identity crisis. How can I respect it? 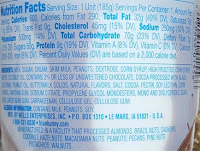 It should have been peanut butter everything - I can forgive the base, but not the schizophrenic swirl. I have spoken. 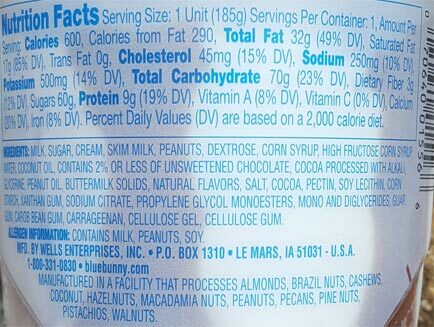 I have tried several of these, and think they are good - but for the calories, I'd rather eat something else. I think my favorite out of all of them was the mint, but I tend to favor mint flavors. @Bagels: I guess the best way to think of it is that it's over 8 ounces, so divide the total by 2, so it's about 300 cals per serving just like a super premium. Gotta be the mix-ins and swirl though. I tried one of each when they went on sale. The strawberry shortcake was my favorite. The turtle was my least favorite, but I think it'd work if it had a chocolate base. I didn't notice an aftertaste.